Those sorts of things never happen in real-life trials. At least not very often. 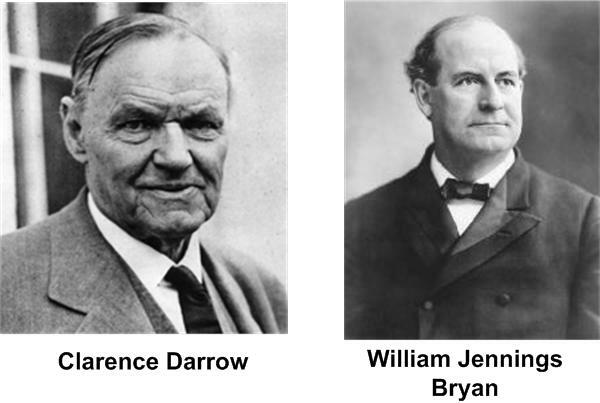 One of the most dramatic events in a trial was surely when Clarence Darrow called prosecuting counsel William Jennings Bryan to the witness stand in the famous trial of State of Tennessee v. Scopes. It was to be a battle of wits between two of the most famous of American attorneys as Darrow quizzed Bryan about his interpretation of the Bible and whether everything in it should be interpreted literally — they covered Jonah being swallowed by the whale (while disagreeing over whether it was a whale or a big fish), Joshua causing the sun to stand still at Jericho, and the date of the great flood. Darrow pressed Bryan on the inconsistency between what is taught in the bible and the scientific discoveries of humanity. It was truly gripping stuff and reports exist of people from miles around Dayton, Tennessee pressing into the courtroom to witness the drama. In the end, Judge John T. Raulston ordered the whole session — which had taken place outside the view of the jury — expunged from the record. The result of the Scopes Monkey Trial is well known. Scopes was found guilty of teaching evolution to schoolchildren in violation of the Butler Act and fined $100. His conviction would ultimately be reversed and dismissed by the Tennessee Supreme Court on technical grounds — rather than constitutional grounds — with the weary comment that “Nothing is to be gained by prolonging the life of this bizarre case.” The Butler Act, forbidding the teaching that Man evolved from “lower orders of animals,” would remain valid law in Tennessee until it was repealed in 1967. It is interesting that Tennessee has again become a sort of battleground over the teaching of evolution to schoolchildren. It is being watched by those who take an interest in the teaching of evolution and creationism because of bills that are currently pending in that state’s legislature. Those bills are similar to bills that have been defeated in other states like Oklahoma and New Mexico, and represent a new strategy by those who wish to have creationism taught as science to American schoolchildren. Other tactics, such as directly challenging the exclusion of creationism from scientific curricula or couching creationism as “creation science” or “intelligent design” have failed. The new approach is to use scientists’ love of critical thinking as a wedge to insist that teachers not be prohibited from “helping students understand, analyze, critique, and review in an objective manner the scientific strengths and scientific weaknesses of existing scientific theories covered in the course being taught.” This is to be done to further the “purpose of science education … to inform students about scientific evidence and to help students develop critical thinking skills necessary to become intelligent, productive, and scientifically informed citizens.” All good stuff. A copy of the house bill can be read here; the senate version is essentially identical. Critics of the bill point to the fact that the examples of controversies given in the bill — namely “biological evolution, the chemical origins of life, global warming, and human cloning” — are not, in fact, subject to significant scientific controversy. This is certainly true at the level at which such subjects might be addressed to childen. The bill is seen as dangerous to the integrity of scientific education because it may provide a license to creationist teachers to proselytize contrived and misleading criticisms of dominant scientific theories under the guise of science. This is a legitimate concern. It is possible that I am naïve, but I don’t particularly fear this type of legislation, even as I recognize the strategic and tactical motivations pressing for it. It is clearly another attempt by creationists to infiltrate scientific teaching to children in accordance with the Discovery Institute’s infamous “wedge strategy.” A copy of the leaked 1999 document describing that strategy is available here. But it is not a deceptive “equal time” provision as has been attempted in the past to compel the teaching of nonscientific ideas in a science class. And teachers already have a great deal of discretion and influence in classrooms. Even with those parts of a curriculum they are mandated to teach, they undoubtedly affect students’ perceptions by their own demeanor and subtle expressions of opinion and skepticism. It is unrealistic even to attempt to regulate every nuance of a teacher’s presentation. Doesn’t there come a point when scientists are ready to say “Bring it on”? I have confidence in the scientific method and confidence that views developed using that method will prevail. And part of the scientific method is to allow criticism so that it can be exposed and defeated when it is wrong. There is no doubt that past strategies by creationists were antithetical to science; I just have trouble seeing exactly how this one is.